(Carson) – Brandon McManus kicked a 34-yard field goal as time expired to give Denver a 23-22 win over the Chargers Sunday at the StubHub Center. 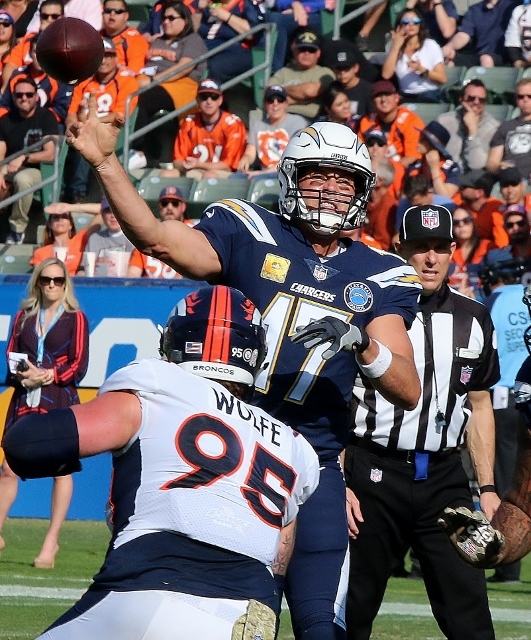 The Chargers took over possession with 3:45 left in the fourth quarter and drove down to the Denver 48 yard line with less than two minutes left. But on fourth down and seven Philip Rivers threw the ball down at the feet of Keenan Allen for an incomplete pass and LA was forced to punt. The Broncos had no timeouts left but they had the ball after the punt at their own eight yard line with 1:51 left on the clock. The Chargers could have run the ball on fourth down and taken nearly 40 more seconds off the clock but opted to throw instead. The Broncos took full advantage driving down the field and winning it when McManus split the uprights as the clock hit zeroes. The Chargers opened the scoring on their first drive when Michael Badgley kicked a 46-yard field goal. After a Denver punt Badgley added three more with a 45-yard boot with 39 seconds left in the first quarter. Early in the second the Broncos pulled off a fake punt that resulted in a pass completion for a first down. On the next play Phillip Lindsay broke off a 41-yard touchdown run to give Denver a 7-6 lead with 12:05 left in the quarter. Later in the quarter Denver, pulling out all of the stops, went for it on fourth down and one at the Charger 11 yard line but Lindsay was stood up for no gain. The Chargers then drove 89 yards for the score. A Philip Rivers pass to Mike Williams down to the four yard line set up a four-yard strike to Keenan Allen to give LA a 13-7 lead with 2:39 left in the half. The Chargers began the third quarter with a nine-play, 75-yard drive. Rivers hit Antonio Gates with a six-yard touchdown pass to cap the march. Badgley’s extra point attempt sailed wide left to leave the Chargers with a 19-7 advantage. The momentum turned later in the quarter when Von Miller stepped in front of a Rivers pass and returned it to the Charger 18 yard line. Three plays later Royce Freeman bolted in from the three to cut the Chargers lead to 19-14 with 2:24 left in the third quarter. The Chargers were forced to punt on their next possession. Denver took over and marched 73 yards on seven plays. Lindsay took a snap out of the shotgun and raced in three yards for the score as the Broncos regained the lead at 20-19 with 12:17 left in the fourth quarter. LA started the following possession at its own 28. 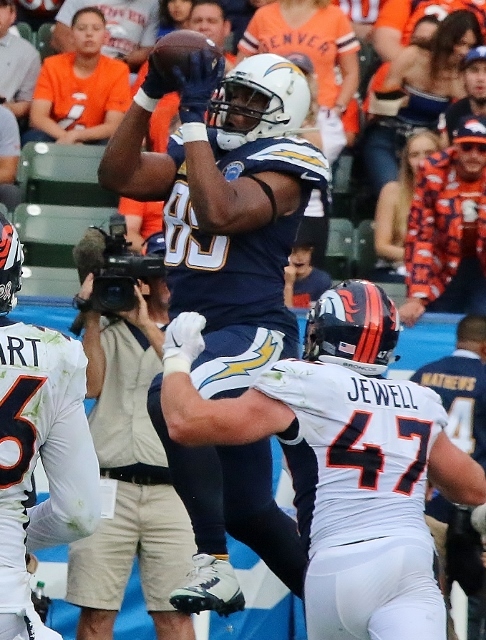 The Chargers marched down to the Denver 12 where the drive was halted, but Badgley booted a 30-yard field goal for a 22-20 lead with 6:51 left. 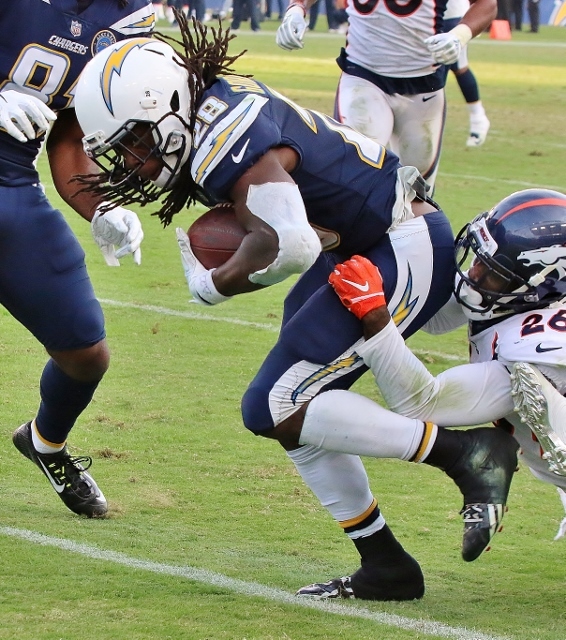 Denver was forced to punt and the Chargers took over at their own 20 with 3:45 remaining in the fourth. After a Rivers pass to Gates gave LA a first down it appeared the Chargers were in control but it got away in the end. Rivers had a big day. He completed 28 of 43 for 401 yards and two touchdowns. But he was hurt by the two interceptions. Melvin Gordon had 69 yards rushing and 87 receiving. For Denver Case Keenum was 19 of 32 for 205 with no touchdowns but also no interceptions. Lindsay finished with 79 yards on 11 carries and two scores. The Chargers fell to 7-3 with the loss and will host the Arizona Cardinals next Sunday. The Broncos improved to 4-6.